A cold spring; the slightest hint of warming. Squirrels chase across budded trees swaying, still leafless. Settling down behind the barn, hiding from the wind, sunlight creeps in slowly. But chives peek through the soil. Milwaukee chefs Dan Van Rite and Dan Jacobs have secret room, a sacred place, tucked inside their restaurant, DanDan. The memory of their great-grandmothers, their recipes, and their sense of family becomes a gathering space, a place to bring memory and imagination together in food, a place they call EsterEv. The tasting menu, eclectic and unconstrained, ranges freely across cuisines, culinary approaches, and flavors; all seasonally inspired. Though globally inspired, occasionally the Great Lakes roots of these chefs peek through on the monthly-rotating menu selections. Chicken liver financier, “deviled egg”, and latke with smoked salmon started off a recent visit, the “deviled egg” an egg white meringue filled with a savory puree. A previous menu included a pastrami-style short rib, red cabbage puree, crisped pumpernickel, potato cake, pickled mustard seed and red mustard leaves. These are the tastes of Great Lakes cuisine peeking through in newly inspired ways. Our inspiration for the dish below was a potato soup they served with a dollop of mashed potatoes in the center; could be the perfect canvas for our spring garlic chives. We used Yukon Gold potatoes, originally developed by Gary Johnston to thrive in the soils of southern Ontario, where the Great Lakes moderate the temperatures and former lake beds create fertile soil. This recipe involves several steps, but much of it can be done while waiting for potatoes to boil. Alternatively, you can just enjoy the rich, creamy indulgence of the soup on its own. But don’t forget the fresh chives. Add butter and leaks to large stock pot on stove-top over medium heat, sprinkle lightly with salt. As leeks begin to soften and just start to caramelize, add half of the wine. As wine cooks off, add remaining wine. When wine has cooked off a second time, add broth, bay leaves, marjoram, and potatoes. Bring to a boil over high heat then reduce to simmer until potatoes begin to fall apart, about 25 minutes. Allow to cool. Puree until smooth. Additional broth retained from next step can be used to thin to desired consistency before service. In a large pot over high heat, bring potatoes, broth, and bay leaves to a boil, then reduce to simmer until potatoes begin to soften (but not fall apart). While potatoes cook, add 1 Tbs. butter to a sauce pan over medium heat with shallot and thyme. When shallot begins to become translucent and just start to caramelize, add wine. Simmer until wine is completely cooked off, then remove from heat and add remaining butter and stir together. When potatoes have finished, drain and save broth. Add the potatoes back to the pan and mash along with all of the butter mixture and the heavy cream until very smooth. Note: We used smoked pork lard derived from our method of preparing Nueske’s bacon, butter can be used as a substitute here. In a sauce pan over medium-high heat add the lard and oil (or butter) and the potatoes. Allow to cook until deeply browned, but not burnt, the color of dark caramel, but not chocolate. The potatoes should be drained on a paper towel when finish to drain the oil. Lightly salt to taste. We served grilled cheese sandwiches alongside, featuring a blend of three different aged white cheddars. A dollop of the shallot mash potatoes is surrounded by the potato leek soup, bacon-flavored matchstick potatoes as crisp “croutons” on top and dotted with freshly chopped chives. We are happy to add Chef Lenny Russo and Heartland to our Restaurant page. A chicken sausage prepared in the same style and with the same spices as a traditional bratwurst. 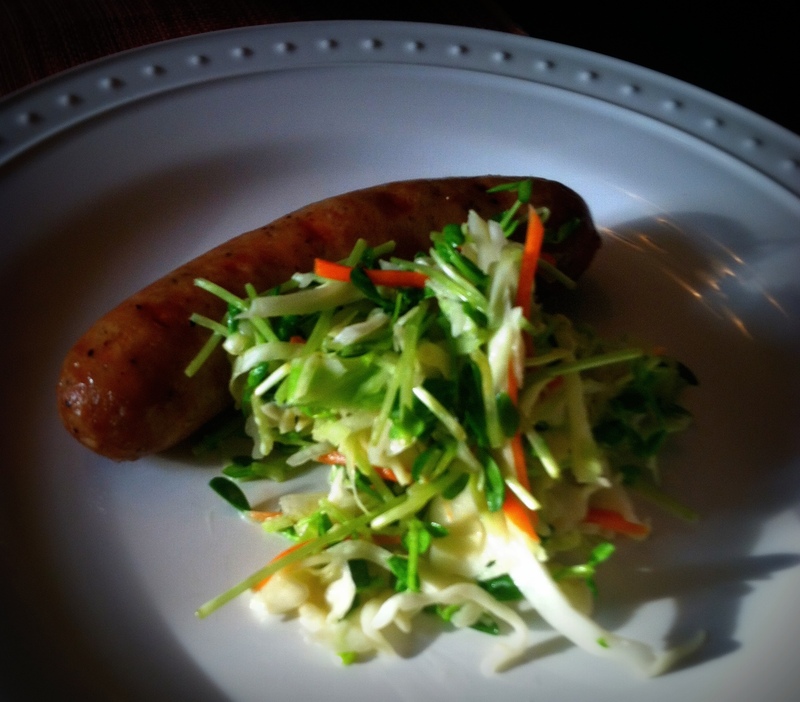 The coleslaw is cabbage, carrots, and pea shoots with a traditional mayonnaise based dressing but the addition of a Saison craft brew vinegar echoes the tang of serving bratwurst with sauerkraut. A light, summery take on a very traditional brat and kraut. We can see, feel, and taste the influence of Great Lakes Cuisine. When defining cuisine, particularly as it applies to the work of talented chefs across the region, innovation often makes clear delineation difficult. We discussed the problems of “defining a cuisine” in a previous post and we won’t repeat that discussion here. The particular idea we address here is Italian-American Cuisine. Anyone traveling throughout the Great Lakes Region realizes a significant immigrant population settled in the region and in many cases have held strong to their ethnic, culinary traditions. The deep-dish pizza in Chicago is a unique testimony to this process. The cuisine is at once clearly Italian and clearly American, which is why we have previously maintained that Italian-American is not part of Great Lakes Cuisine, because it is clearly and definable part of another tradition. 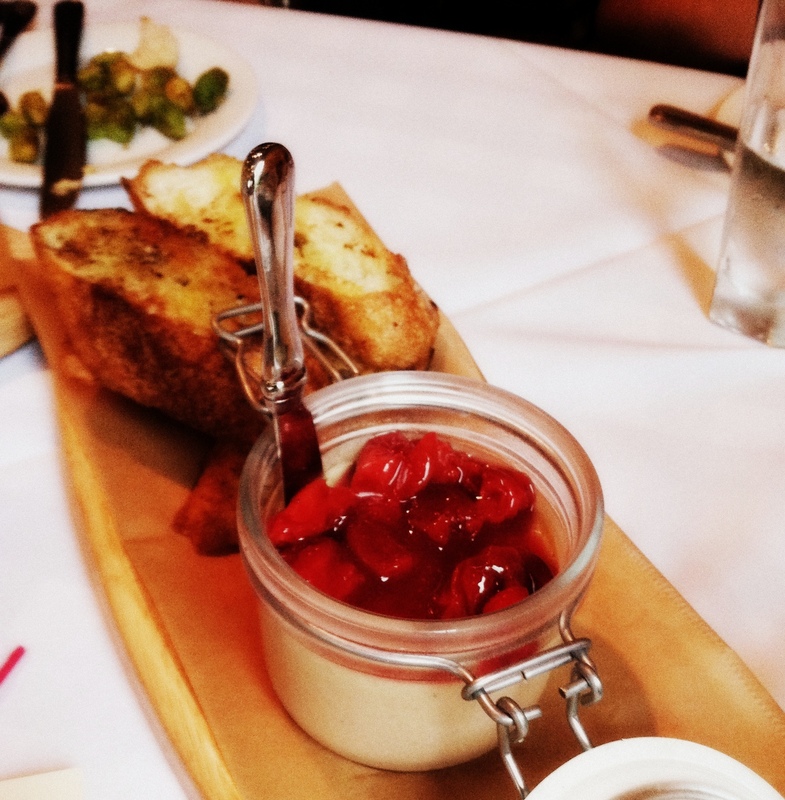 We began with a several appetizers and among them was this offering – Tuscan Chicken Liver Spread with Door County Cherries. Lush, earthy flavors of the liver spread created the perfect contrast to the tart fruitiness Door County Cherries. Another offering featured goat cheese curds, heated until just softened with N’duja and Pachino tomatoes. Goat cheese curds, such as those you can purchase from LaClare Farms, have an appealing “chew” to their texture and a bit more pronounced flavor than traditional cheddar curds. N’duja is a spicy, spreadable sausage from Calabria (or you can get a great version from Underground Meats in Madison, WI). 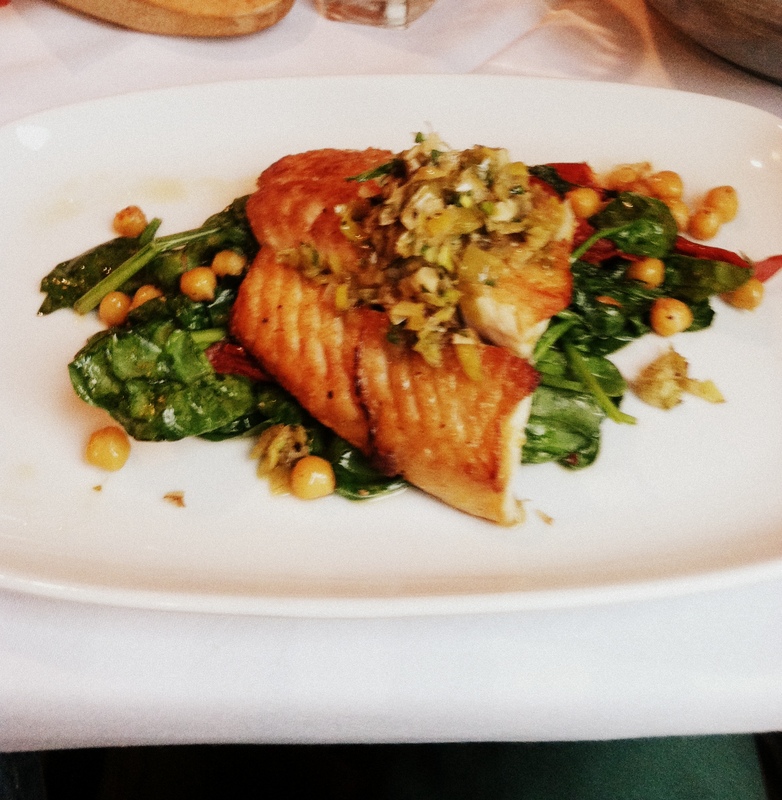 In addition to a table full of excellent Italian-inspired dinner offerings, we enjoyed a Walleye Pike with chickpeas, garlic spinach, Pachino tomatoes, grilled leek gremolata. The flavors and preparation throughout the meal were unmistakably Italian, but the ingredients were local and often featured in unique ways. Mangia is unmistakably Italian cuisine, but in the hands of such an innovative, and accomplished chef, elements of Great Lakes Cuisine still shine through. Though we will not add Mangia to our Restaurant section, as it does not fit the stricter definition of Great lakes Cuisine we are utilizing here, it is truly great cuisine. This post will be a bit longer and more esoteric than many of our posts as we attempt to lay-out a fundamental problem at the very core of our efforts here. A recent video discussion between Kyle Cherek and Ardent’s chef/owner Justin Carlisle was featured here recently as something of a raison d’être for this website – simply, to create a name for an emerging cuisine and thereby promote it. In our view, this is not just a local food movement, this is not just a comfort food movement, this is an outgrowth of an ethno-culinary tradition being re-imagined and re-invented by a number of highly creative and innovative chefs in the Great Lakes region. We began with the very clear belief that just as the phrases “Napa Cuisine”, “Tex-Mex Food”, or “Southern Cooking” conjure a basic understanding of what food is being discussed, the phrase “Great Lakes Cuisine” can capture an idea, a method, an ethos by which we can come to understand something about this food, and the chefs as the creative force behind it. But definitions inherently create problems, particularly when we are attempting to categorize a movement predicated on originality and creativity. And so I come to the problem of the Odd Duck. “People often ask, “What kind of food do you serve?” It is hard for us to be specific about our menu, because we view this not just as a project or a business – but as a way of life, a journey that includes our staff and all of you, as well! Our food and cocktails are inspired by things as varied as the smell of grass in the spring and street food in Turkey. The goofy creativity of the kids in our lives, the summer farmer’s market at South Shore Park, the memory of the perfect popsicle when we were children. Now, the creativity and collaboration has led to dishes such as Kale Salad, Dried Cranberries, Roasted Pear, Maple Vinaigrette, Pecans, Aged Cheddar Mornay or perhaps you would prefer Chicken Schnitzel, Handmade Bratwurst, Cheesy Pork Belly, Spätzle, with Brussels Sprout Sauerkraut. Their cheese selection includes many of my local Wisconsin favorites such as Hook’s Cheddar, Carr Valley Mobay, and Saxon Creamery Big Ed’s Gouda. The charcuteries selection features Underground Meat Company (a true favorite here) as well as house-made options. All clear examples of local traditions being re-invented and re-imagined leading to, based on my recent dining experience, truly wonderful results. This is Great Lakes Cuisine. And yet Chef Bachhuber and his crew have no hesitation to include dishes like Indian Seafood Saag with mussels, octopus, and scallops in a coconut curry or berbere rubbed lamb loin with Ethiopian butternut squash and lentil stew or Hong Kong tofu with a sweet chili glaze. They just as successfully pull of the global forays as they do the local features. So here is our “definitional” existential question: Is the Odd Duck restaurant an example of Great Lakes Cuisine? 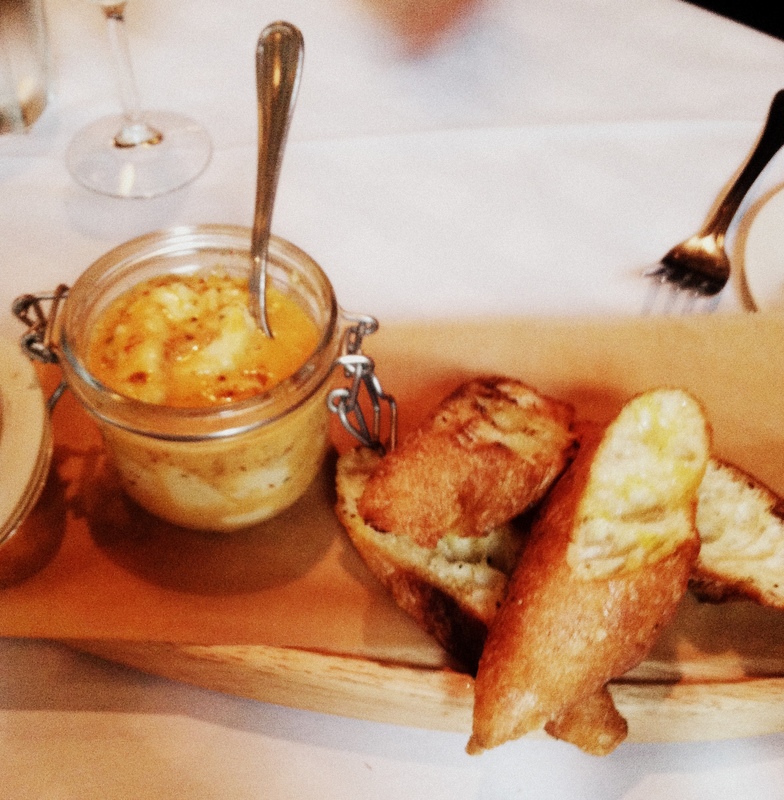 We could simply say it features occasional dishes which represent Great Lakes Cuisine. We took exactly that approach with Harbor House in Milwaukee, which clearly defines itself as a coastal seafood restaurant, but served this fantastic version of a local favorite. It is possible the fish was from Canada, the cabbage from Napa, and the spaetzle imported (though I really doubt it). The dish, from a compositional and flavor profile, was clearly referencing a local tradition of the fish fry in a new and delicious way – a fine example of Great Lakes Cuisine from a restaurant which we can comfortably say would not fit the definition. Or we could say Odd Duck is a Great Lakes Restaurant like we did with Balzac Wine Bar. On a recent dinner menu, Balzac featured dishes such as Potted Pork with House-made Apple Sauerkraut or Grilled Trout with Brussels Sprout Slaw. Good examples of our Great Lakes Cuisine. Yet at its core, Balzac is a French bistro made uniquely Milwaukee by great owners and a great staff. They often feature local sausages and unique takes on local flavors; often enough, we felt, to warrant being defined as Great Lakes Cuisine. This issue arises only when you care to define the cuisine. Many loyal patrons and dynamic chefs will have no interest in this very academic affair. Witness once more, Justin Carlisle’s reaction on the clip mentioned at the outset. Yet there is a compelling reason to define this cuisine – by oversimplifying our message we can cut through in an over-communicated society. This idea was expounded by Jack Trout and Al Reis in their seminal work on advertising called “Positioning: The Battle for Your Mind”, in which they detail ways in which companies, people, and even countries have had to clearly define themselves in order to gain a firm hold in the mind of the consumer. The key marketing idea is to narrowly define the idea down to its essence. This in the end is our aim – To clearly capture and promote the idea of an emergent cuisine, to thereby capture the imagination and appreciation of a wider audience. We’re glad to be adding two new restaurants to our list of representatives of Great Lakes Cuisine, and both just happen to be in Michigan. Mia & Grace is located in Muskegon, opened by two transplants from the Houston area, who moved to be close to family upon the birth of their daughter. Chefs Jeremy and Jamie Paquin took a chance by opening a small bistro in the downtown Muskegon area and focusing on farm-to-table cuisine, but the accolades they have received more than confirms their vision. The cuisine on their ever-changing menu does range across a variety of ethnic and regional styles, but enough of the offerings reflect the local ethnic traditions to warrant inclusion (Mia & Grace – Food Menu – Sandwiches). The representative dish we’ve chosen is the Beef Tongue Schnitzel, a traditional German approach adapted to an oft-neglected cut of beef. Pair it with the Apple-Fennel Cole Slaw and the Bacon & Shallot Potato Salad and you have a stunning update on a number of German classics all on one plate. The inclusion of house-made sausages on the menu, including a gourmet hot dog, along with house-made pretzels and meat pies further provides ethno-culinary echoes that are a hallmark of Great Lakes Cuisine. The relaxed atmosphere, local ingredients, and unpretentious presentation all fall in line with our definition as well. Our next Michigan inclusion is not a restaurant, but a chef. Chef Steven Grostick is responsible for creating and preparing foods for The Produce Station in Ann Arbor. Formerly the chef at Toasted Oak, the video series Great Lakes – Great Tastes featured an interview with him then, which we include here because of the obvious passion he exhibits in talking about his culinary vision. He has continued to feature his house-made Kielbasa at The Produce Station as well as a rotating selection of other charcuterie. He worked for many years with Chef Brian Polcyn at the former Five Lakes Grill, during the time Chef Polcyn was working on the recipes for his well-respected book Charcuterie: The Art and Craft of Salting, Smoking, and Curing. The representative dish is Chef Grostick’s famous house-made kielbasa, which he serves off the grill on a pretzel roll, with a sauté of peppers and onions, and a caraway beer mustard. Simple, good food and another excellent example of Great Lakes Cuisine.